Hirundines are a group of birds found in every continent including occasionally Antarctica! This group ‘Hirundinidae’ consists of around 90 species of swallows, martins and saw-wings; we typically see swallows and martins migrating from their warmer winter climates to breed here in the UK. 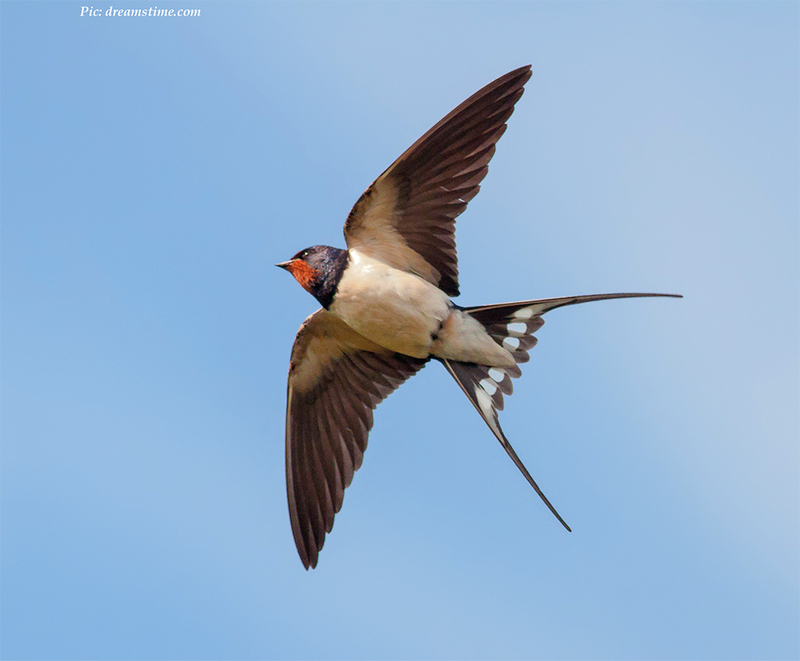 The most common visitor we see swirling above our heads here in Swansea is the barn swallow (pictured right). Often heard chatting amongst themselves as they fly around open landscapes typically searching for man-made structures on which to clump together mud pellets to form a bowl-shaped nest in which they can breed. They’re easily identified by their black-blue sheen and extremely forked tail. They usually arrive here in the spring ready to breed in the summer, but a number of birds had already begun to return in February this year. But that is not all. At Whiteford Point, Gower we were graced with not only barn swallows but a red-rumped swallow! (below left). This bird typically breeds in the warmer temperatures of southern Europe including Spain and Portugal; however, this bird had over-stretched its journey and arrived with a barn swallow in Whiteford. It’s roughly the same size as its UK breeding cousins although can be easily distinguished by the large red rump and red facial markings. It’s interesting to hear that another red-rumped swallow arrived in Pembrokeshire a few days later. However, that bird had slight damage to its tail which usually happens with age or a run-in with a predatory bird, whereas the Whiteford bird was pristine, a double visit to South Wales by the swallows. It’s not only barn swallows that migrate to the UK in order to breed. 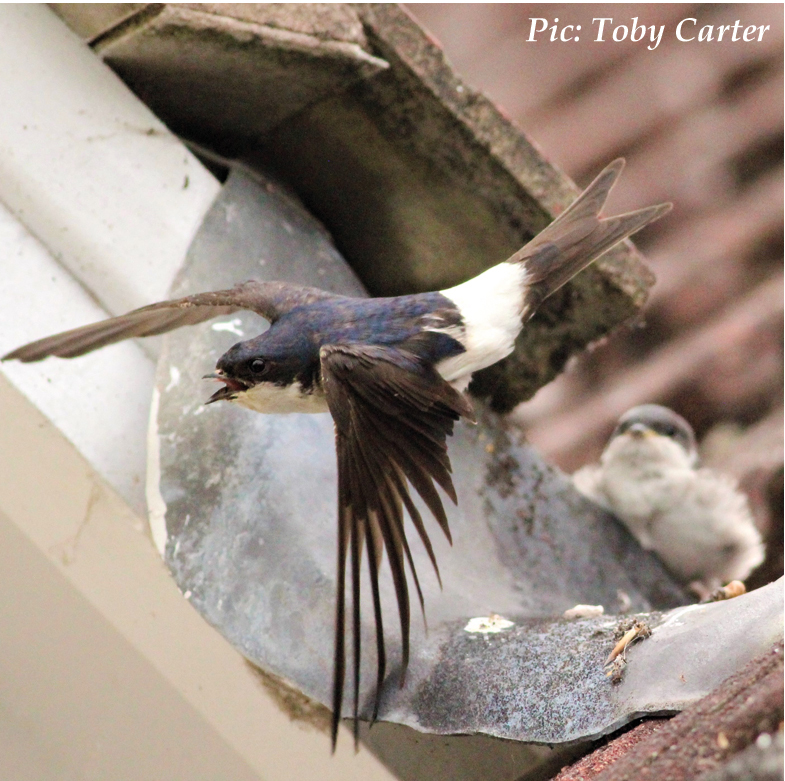 We also see house martins (above right) amongst our towns particularly in the housing estates of Swansea. They’re smaller than the barn swallows although still have that classic Hirundine shape and follow roughly the same migration route from Africa to the UK. They appear black in colour, although if you manage to see these beauties in the light then you can really appreciate the blue/purple iridescent sheen that covers their bodies. Birds of the martin family prefer to nest near to one another, which is why we usually see a few pairs nesting in the corner points or porches of our houses (pic right), and also, they are one of the most wide-spread birds in Europe with 86% of pairs attending to rear two broods (two lots of young) per year. Although given the amount of these martins that breed in the UK, it would appear that not all pairs stay together! It’s common for the birds to pair up each year and attempt to rear two broods but even if they both survive their migration to and from the UK it’s rare that the two will pair and breed together again. They are champions of recycling, with nests being re-used the following year either by one of the pair or by a new pair. This saves the birds a lot of energy given that each nest is made up of at least 1,000 beak-ball mud pellets. It’s not just the house martins that will recycle their nests, wrens and house sparrows are also known to use the strong and sturdy nests as their own bases to have their young. You may wonder whether having two birds both with large numbers breeding here would cause problems for each other? Luckily that is not the case as house martins feed at a higher altitude than swallows. 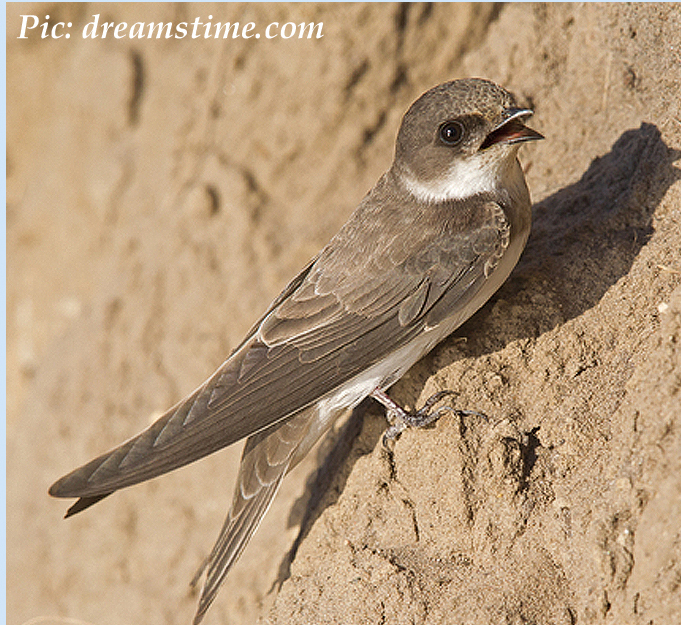 Another member of the martin family that we see here in Swansea is the sand martin (left), which is smaller than its cousins the house martins and is brown in colour. These birds nest in sand banks in large colonies and you may see lots of these little brown wonders whizzing up and down rivers looking for bugs to eat off the water’s surface. You can buy and erect house martin or swallow bowls in the alcoves of your roof or under the ledges of sheds and out buildings. These are ceramic/plastic/resin bowls that fit onto ledges, making it easy for you to take down and clean during the winter season. This provides a great nesting place which won’t fall down during the breeding season!